Howard Park residences in Roncesvalles Village by Triumph Developments, architecture by RAW Design. Two phases, with a first phase 10-storey east tower, to be followed by an 8-storey west building. 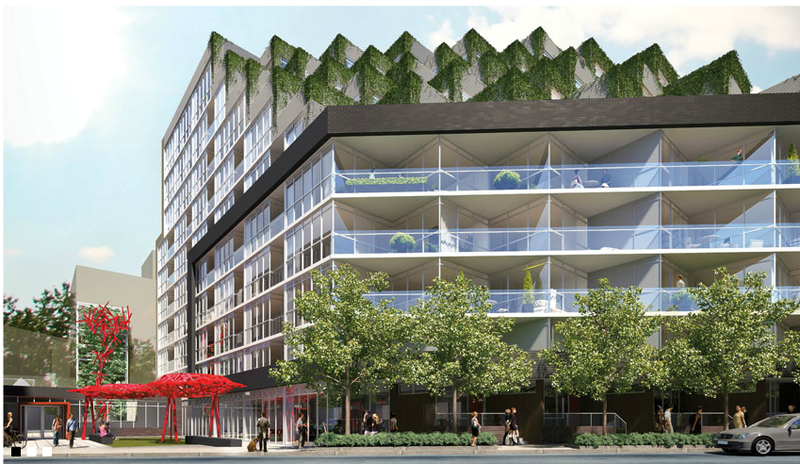 From www.rawdesign.ca: This collection of properties along Howard Park between Roncesvalles Avenue and Dundas Street West have been combined to create an eclectic site for a new mixed use building with retail at grade and up to ten stories of residential above. Informed by the angled property lines, the distinctive building footprint seeks to maximise floor area and selected views, while the proposed green roof seeks to minimise impact on the neighbouring properties. Gently sloping up towards the centre of the site, the roof creates a welcome swathe of green on the horizon and aids in reducing unwanted shadows on the surroundings. Terraces cut into the slope of the building will enjoy a view of the city as the landscape drops away.